Blueberries are teeny tiny powerhouses. They are packed with vitamins A and C, antioxidants and phytochemicals. Normally, we eat blueberries to enjoy their benefits, but there is another way you can consume blueberries: your skin! 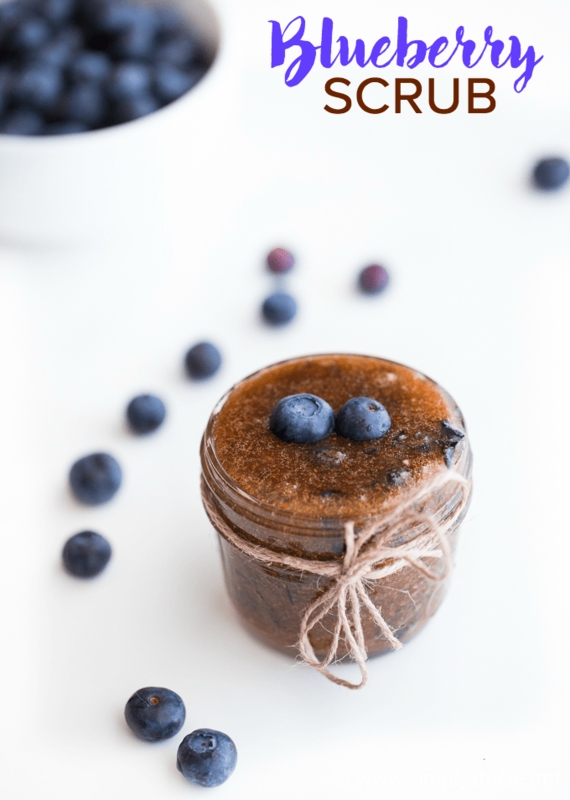 I’ve made fruit sugar scrubs in the past because they are super simple and affordable to whip up. If you want to save money on beauty products, try making your own. You can save a bundle! You don’t need any fancy equipment or ingredients. 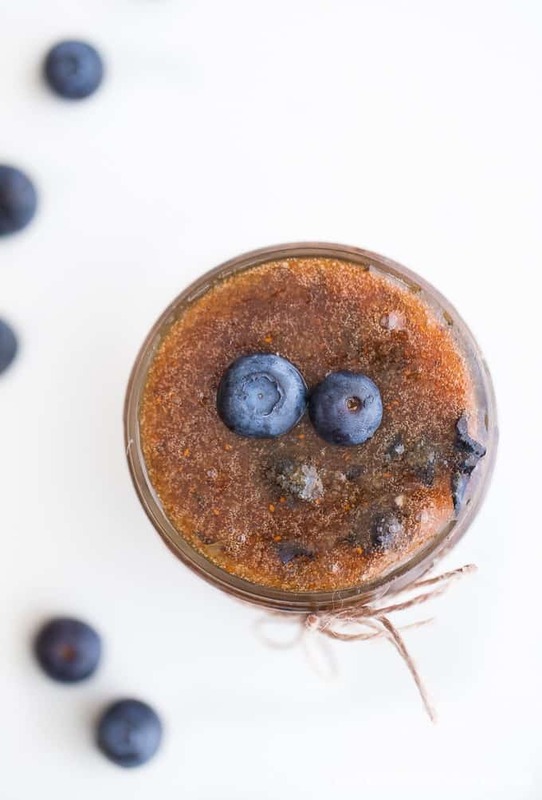 You can find the ingredients in this Blueberry Exfoliating Sugar Scrub at your local grocery store! If I can find them in my small, rural area, I’m sure you can too. 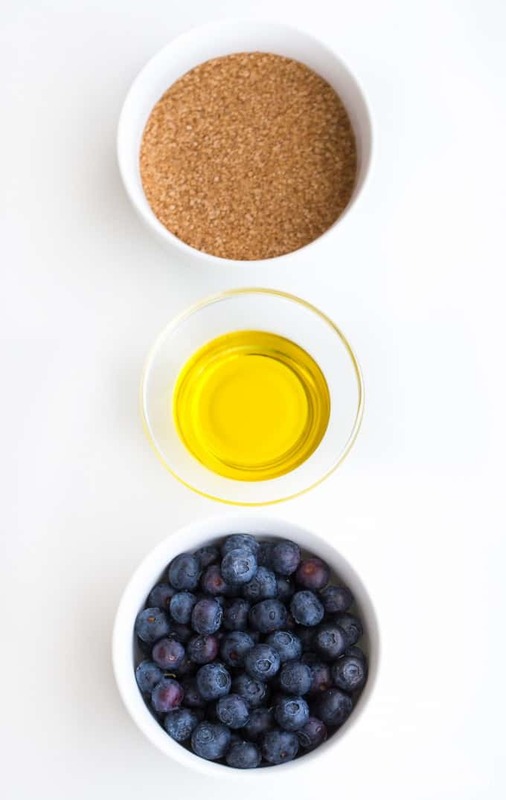 For this particular recipe, you’ll need three ingredients: fresh blueberries, olive oil and sugar. I used raw sugar because it has large granules that will hold it’s shape when mixed with the other ingredients. If you don’t have any, feel free to substitute white or brown sugar in its place. I mashed my blueberries with a fork. If you wanted to use a food processor to puree them up completely, go ahead. I don’t mind the little bits of pulp. If you find the mixture too runny, add a little more sugar into the bowl to adjust to your desired consistency. Mason jars are the perfect way to store your new scrub. 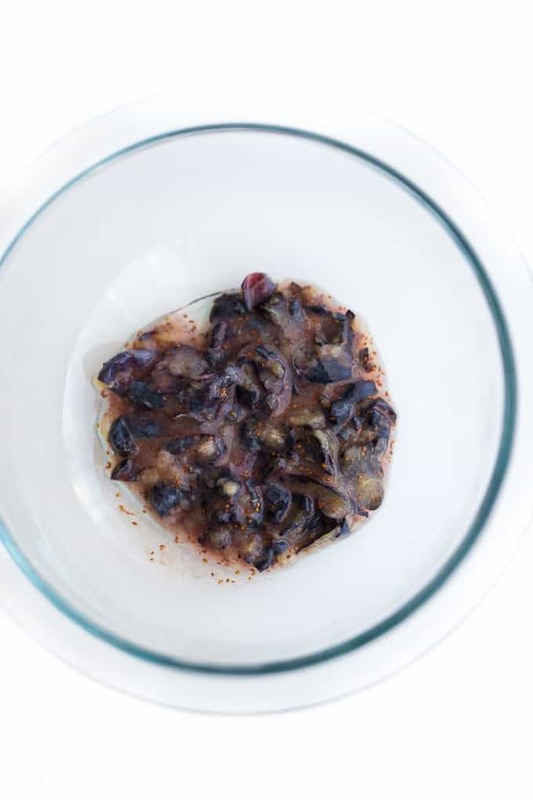 Keep it in the fridge, when you aren’t using it, of course, for up to a week. Mash up blueberries in a small bowl with a fork. Mix in sugar and olive oil, stirring to combine. 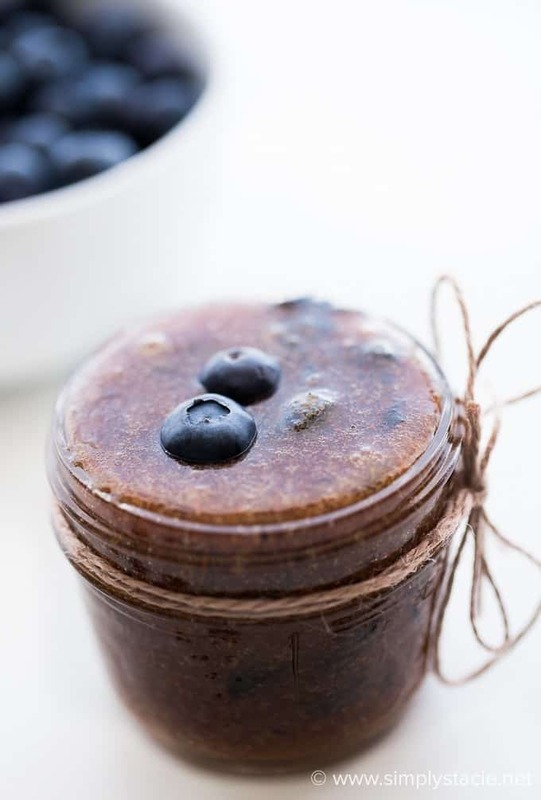 Spoon scrub into a small mason jar. Store in the fridge for up to a week. To use, scrub into wet skin in the shower and rinse off completely. I like using this scrub on my feet, legs and hands since they seem to be the driest and roughest skin. My legs are prone to ingrown hairs and I find exfoliating them regular helps to keep them at bay. My skin feels soft, smooth and moisturized afterwards. I especially need to use this scrub in the winter because the moisture is sucked right out of my skin. My poor hands! 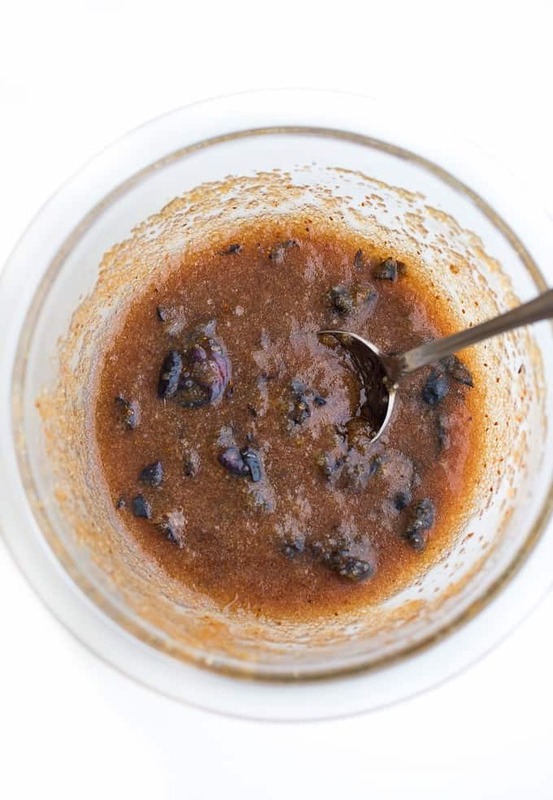 This easy DIY beauty scrub would also make an excellent gift. 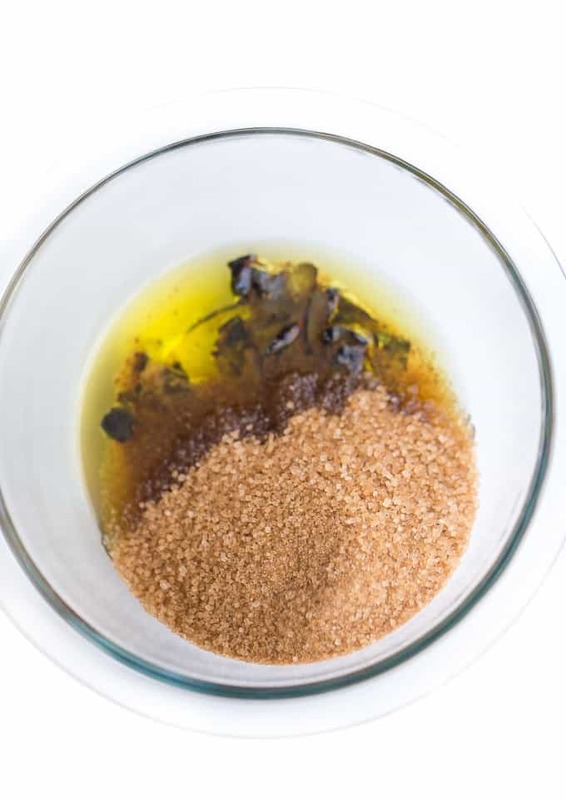 Check out my other DIY scrubs including Sea Salt & Olive Oil Scrub, Pumpkin Spice Sugar Scrub and Homemade Coffee Sugar Scrub. How do you keep your skin soft and smooth in the winter? I need to try this to help me with my severe dry skin. It looks so pretty after it is made. and I want to make it! Simple and easy… And I imagine you smell delicious after using it! I will have o try it. I want to scrub my feet with it. That is a genius idea. I love making my own scrubs but never thought of incorporating blueberries even though I know how good it is for the body! Interesting! I will definitely be adding this to my skin care regimen. Thank you! I never knew making your own could be so easy! thank you so much! I am going to try this! I can almost smell the sweet blueberry scent! Never thought about using blueberry for a skin scrub. I better you it smells good and all natural ingredients are a plus! I wouldn’t have thought blueberries. Sounds good! What a great recipe, I didn’t realize how simple exfoliating scrubs were to make. My mother used to make them all the time, but with how great they worked I figured they were much more work. I love how soft they make your skin though, there is nothing else that does quite as good of a job!! Thanks so much for linking up to Inspire Me Monday. Have a blessed week!! I can’t wait to try this! I LOVE anything blueberry. Great idea! What a simple, yet effective recipe! 3-ingredients perfect! Would love to see you link this up at Welcome Home Wednesdays! 7 blogs, 1 awesome party! I can’t wait to try this! I make a sugar scrub with lavender essential oil and vanilla but this one may have to replace it! 🙂 Thanks for sharing! Cannot wait to try this! So simple and I bet it smells amazing!